Lois McMaster Bujold has been one of Ariela's favorite authors since a friend introduced her to the Vorkosigan Saga in 2010. When she began considering the possibility of illuminating published works, she thought it was a long shot to ask permission to play with Lois' latest works (which just so happen to feature a scribe as their main character, eeeee! ), but figured it was worth asking. To her utter joy, Lois said yes! Thus Ariela has calligraphed, illustrated, and illuminated the opening passage of the novella "Penric's Demon." The layout of the page is inspired by two manuscripts in the British Library collection: Harley MS 4482 and Royal MS 20 D I. The text is written in the Fraktur alphabet, which is part of the Gothic Script family (Ye Olde English font). The illumination at the bottom of the page shows Penric and Gans leaving Jurald Court on their way, so they think, to Penric's betrothal ceremony. A crow in the right margin hints at the path that actually lies in store. Next Monday we will publish the first of three blog posts on the research and artistic choices that went into making an illuminated manuscript from the World of the Five Gods. Celebrate undead love in whatever greusome colors strike your fancy! The next entry in our coloring page catalog comes from our greeting cards. We usually need a low key product release for January, because the third Wednesday of the month usually comes right on the heels of Arisia, when both of us are profoundly Ded of Con. Coloring pages definitely fit that bill. All of our zombie couples are available for $2 each, or you can get a bundle with everyone for $5. Have fun! Looking for an artistic way to remind yourself of just how completely awe-inspiring the universe is? We've got some prints for you, featuring a spaceship exploring the stars and some very eloquent quotes. We wanted to finish the year with a very science fiction piece of art. The space ship and background art comes courtesy of the SpaceScape Ketubah. 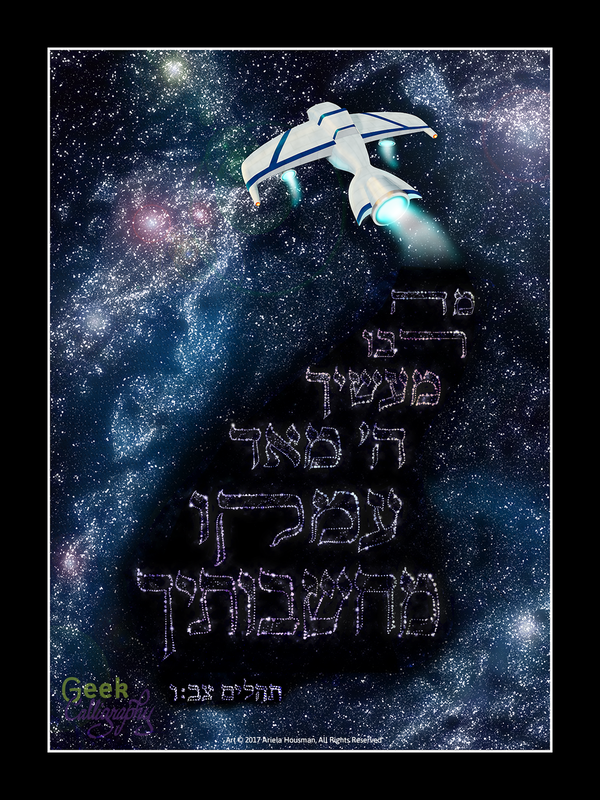 The text on the English print is a quote from Babylon 5, courtesy of Ambassador Delenn: "We are starstuff. We are the universe made manifest, trying to figure itself out." 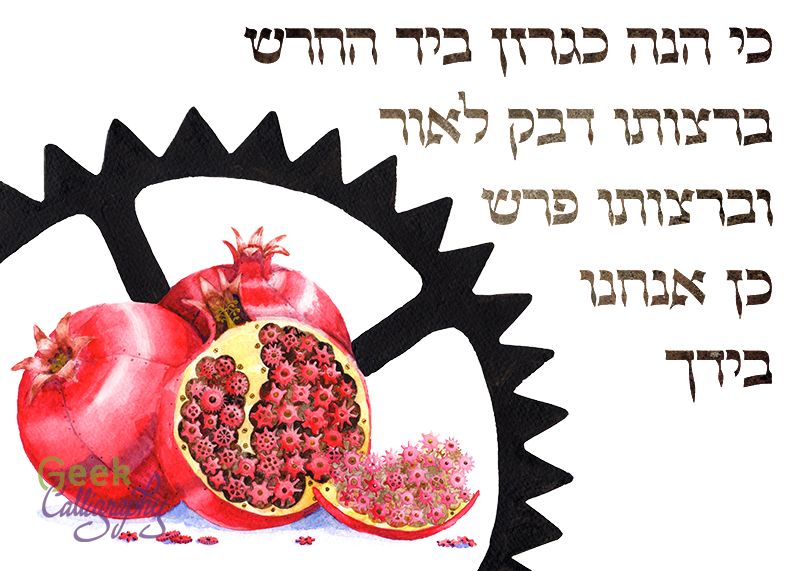 The Hebrew quote comes from Psalms, Chapter 92, Verse 6: "מה רבו מעשיך ה' מאוד עמקו מחשבותיך - How great are your creations, oh Lord, Your thoughts are vastly deep." Ariela took advantage of the shorter text to have some fun with the lettering in a way that isn't possible with a text the length of a ketubah and formed the letters out of stars. Normally this is the space for pithy copy and quips. This card, while inspired by what may have been a joke, is entirely serious. Sometimes you need to tell your friends why you've been hiding from the world. We hope that this card may help you. Not yet, but we at @GeekCalligraphy might have to think about it. 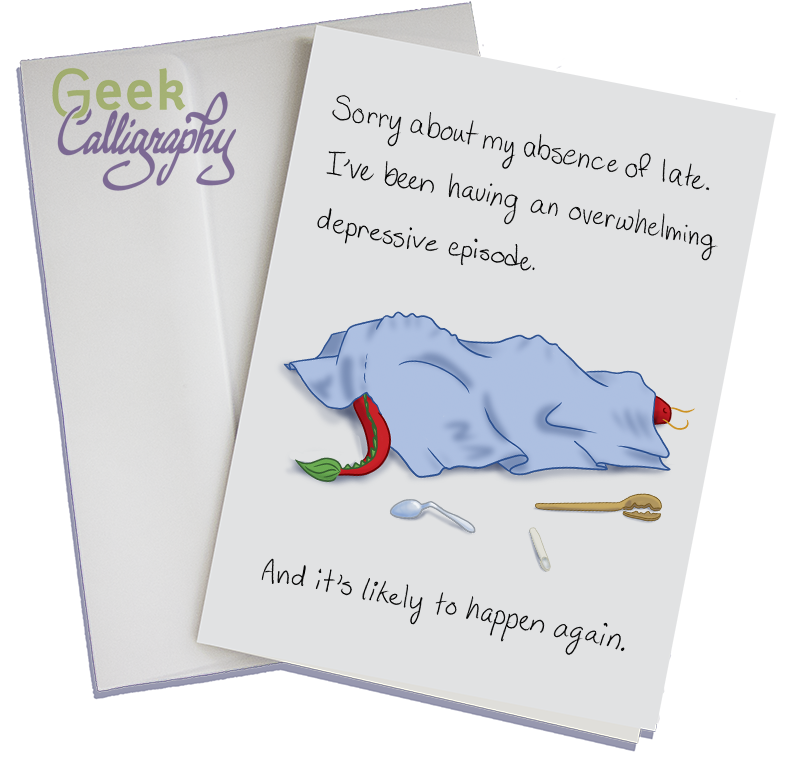 Tweet reads: "is there a greeting card for "sorry i isolated myself for a month, i was having a depressive episode, and it'll definitely happen again"". Apparently a number of people whom Terri follows had liked this tweet. She replied "Not yet, but we at @GeekCalligraphy might have to think about it." Since Ariela also thought it was a good idea, we went forward. The card shows Spoon Dragon hiding under a blanket, all of their spoons lying on the floor. Some of them are bent or broken. The outside text reads: "Sorry about my absence of late. I've been having an overwhelming depressive episode. And it's likely to happen again." The inside is available either with no text or with the following: "It's no reflection on you. I've missed you and value your friendship so much. Thank you for bearing with me." As with all our cards, it is available singly for $4 or in packs. Unlike many of our other cards, we are selling this card in packs of 6 cards for $20 and 10 cards for $30. We hope that this card helps you take care of yourself and keep lines of communication open when you find that the world is too overwhelming.